Are you dreaming of the world ending? It might seem scary, but an apocalypse in a dream is not as strange or unusual as it might seem. Many people dream of apocalyptic types of events in dreams when a sudden change or shift in their life is happening. What Does it Mean to Dream of an Apocalypse? If you are dreaming of the world coming to an end, don't panic! Most of the times these are not prophetic types of dreams that predict the future! For most of us, dreaming these things means that we are changing and are ready to face a new way of life. Are You Currently Experiencing Any Stressful Events? 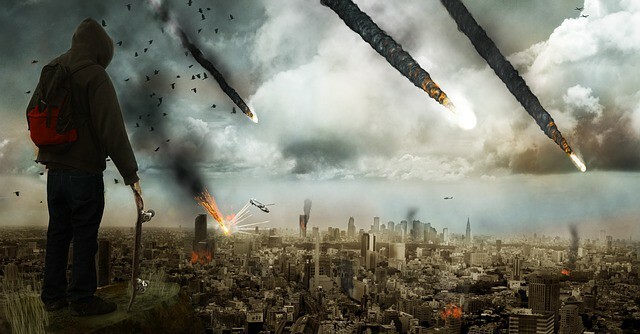 Apocalypse dreams are often triggered by real life events that are stressful. These types of events include things such as growing into adulthood, starting a new job, getting married, going through a divorce, or even saying goodbye to a loved one who has died. Many times it may suggest a significant event that may transform your entire life is happening and everything at you know is coming to an end. These events are known to be extremely stressful and so it makes sense that these emotions and feelings would become present in our dreams. The emotions you feel during an apocalypse in your dream can often be manifestations of the emotions you feel in your present life right now. For example, you may feel anxious, frightened, alone, stressed out, and upset. Fortunately, most of these changes while stressful are all a natural part of life. Being aware of your dreams and the meaning can help you take care of your own well being throughout these difficult moments in life. Much of the emotions are created by our natural fear of the unknown and that we do not know what will happen next in our lives. The mysteries of life can be frightening when you are not sure what is about to happen. It's not unusual to have a dream about an apocalypse when you are not sure whether the outcome of this new transformation/change will be a positive or negative experience. Many people also have these types of dreams when they are feeling unprepared for a situation. You might be afraid that something that is going to happen in the future will not go well. For example, maybe you are supposed to do a presentation in front of a large group. If you're not comfortable with public speaking or you are afraid you will not do a good job on the presentation, it is likely you will have these types of world ending kind of dreams. Have any Apocalypse dreams you would like to share? Tell us about them in the comments below! I have a lot of dreams of my childhood home in this dream I was an adult it was a beautiful day and all the sudden there was a huge earthquake grumbling and the skies got really dark and lots of damage to the house and buildings my mother who is now deceased was in my dream we were running around the house trying to find people to help, it was the end of the world… I felt very frightened. Then woke. I don’t remember my dreams often. But for the last month or two once or twice a week I remember one and they all have the same basic theme I guess you would say. First the world ending for one reason or another whether it be nukes, aliens, the latest an act of god. Second I always see the same girl that I haven’t seen in three years since I graduated high school. I don’t know much about dreams but I do know that I’m not going through anything life changing at least I don’t think I am. I am scrabbling along a floor strewn with decomposing bodies, trying to help my family to a higher platform and safety (apparently). I often encounter cousins or school friends who I have not had any (real life) contact with for decades. There is always some impending threat either from Aliens or Zombies or Vampires, and there is a time limit associated with getting to safety. Strangely, despite the horrific nature of the dream, I am not unduly threatened by unfolding events, but almost see it as a challenge that I must complete. Every three months or so I have the same dream. I am calming preparing to leave my house and taking essentials – clothes and food For me and my husband. It so real. At the end I pour dog food all over the house and say we can’t take them with us. They will get us killed. Zombies or need of the world. It horrifying and I wake guilty and sad that I killed my dogs. In one recent dream I shot all three of them. They are sweet little dogs and I am horrified by these realistic dreams. But instead I had a dream where where was this Apocalypse going down and I’m trying to bring my family together so we can leave from the town we were hiding in since it didn’t seem safe. I found the “choice” of the dream’s plot was interesting and I feel like I understand what my mind was trying to say?? I had a dream where I was on a tour group in what looked like Israel except it kind of looked like the city in the Movie scorch trials, Our group came into an open cave with big holes and all the sudden you could hear people screaming from a nearby town when I looked up I saw the city in flames and flaming meteorites falling from the sky as I looked one fell right on me and I knew it was the end. Then I immediately woke up but I can still hear the screams.